Save an extra CDN$ 6.81 (31%). Buy the Kindle Edition instead. Start reading Eat Pray Love 10th-Anniversary Edition on your Kindle in under a minute. If wisdom could be traded like currency, author Elizabeth Gilbert would be a wealthier woman by far, though it's likely her fabulous memoir, Eat Pray Love, racked up a few bucks during its stay on the New York Times bestseller list. What Gilbert imparts in her story--basically, bracing self-knowledge acquired during a year of travel following a bitter divorce and a shattered rebound romance--is at once astounding yet totally obvious. As Gilbert would attest, albeit more eloquently, the most important stuff in life is pretty much under our noses, but we occasionally have to shake ourselves senseless in order to see it (enlisting a guru and a medicine man are highly recommended). Take this simple but devastating observation posited while Gilbert was on the final leg of a global tour. "I have a history of making decisions very quickly about men. I have always fallen in love fast and without measuring risks. I have a tendency not only to see the best in everyone, but to assume that everyone is emotionally capable of reaching his highest potential. I have fallen in love more times than I care to count with the highest potential of a man, rather than with the man himself, and then I have hung on to the relationship for a long time (sometimes far too long) waiting for the man to ascend to his own greatness. Many times in romance I have been the victim of my own optimism." Starred Review. Gilbert (The Last American Man) grafts the structure of romantic fiction upon the inquiries of reporting in this sprawling yet methodical travelogue of soul-searching and self-discovery. Plagued with despair after a nasty divorce, the author, in her early 30s, divides a year equally among three dissimilar countries, exploring her competing urges for earthly delights and divine transcendence. First, pleasure: savoring Italy's buffet of delights--the world's best pizza, free-flowing wine and dashing conversation partners--Gilbert consumes la dolce vita as spiritual succor. "I came to Italy pinched and thin," she writes, but soon fills out in waist and soul. Then, prayer and ascetic rigor: seeking communion with the divine at a sacred ashram in India, Gilbert emulates the ways of yogis in grueling hours of meditation, struggling to still her churning mind. Finally, a balancing act in Bali, where Gilbert tries for equipoise "betwixt and between" realms, studies with a merry medicine man and plunges into a charged love affair. Sustaining a chatty, conspiratorial tone, Gilbert fully engages readers in the year's cultural and emotional tapestry--conveying rapture with infectious brio, recalling anguish with touching candor--as she details her exotic tableau with history, anecdote and impression. Copyright Reed Business Information, a division of Reed Elsevier Inc. All rights reserved. 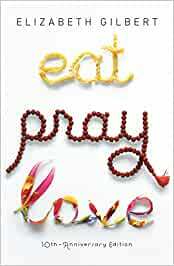 The first time I saw Eat, Pray, Love I didn't really understand the cover or what it was about. I was a young new mother and had no inclination or time to read anything too heavy or too involved because days might pass before I could pick up a book again. Still, I purchased the book after a girlfriends glowing review. I began reading, tired, overworked and in the throws of mommy hood I quickly became bored, irritated, skipped ahead and like many of the poor reviews left here - I just gave up and passed the book on to someone else. I had similar sentiments in that I was just a regular joe blow who would never have the time or the money to take a year and find myself. Find yourself? Who has time for that, and like other reviewers I judged Liz for being able to do such a thing. Everyone I spoke to that mentioned the book I would say, "I just couldn't get into it." To say I was jealous of Liz was an understatement. However, my jealousy was masked with judgement. When the movie came out I was quick to line up and be there on opening night. Why I wasn't sure, but I was curious if the movie would translate better for me. My sister and I attended the movie and I completely lost my sh#t in the movie theatre, crying and relating to that dark and most honest moment where Liz asks God for a sign and he tells her, "Go back to bed Liz." The movie turned my opinion around, I felt more like I could relate to Liz and being that a couple years had passed since I'd attempted the book my life had changed as well. Don't we all want a little more from life? Why should we settle? And why do we as women jump to judgement and shaming when another woman so brilliantly takes control of her life and sets out to find happiness within her instead of relying on someone else. When friends would mention the book again I was a bit of an a@#hole - I'd say, "Loved the movie, hated the book." When the opportunity for me to travel to Italy myself became my reality I jumped at the chance and watched the movie over and over. Still judging the book based on my 20 something self who gave up without really giving it a chance. Later that year I longed to continue travelling and when I decided to go on a book writing retreat where the facilitator gushed about Eat, Pray, Love I thought, "Maybe it's time to give Liz another shot." I downloaded it onto my kindle like device and ordered a hard copy. I dove in head first the night before my flight, having seen the movie almost weekly (I love it that much) I knew I had to have missed something on my first reading. I was not disappointed. I was so in love with the book I devoured every word over the course of 3 flights. I read quickly but I savoured the end for when I was on the beach in Carmel, California. Liz had it all and felt the emptiness that sometimes come with that. We get everything we want and then we realize, Am I really happy? This is not a book about a woman with "first world problems" whining her way through a pre-paid trip. This is a woman just like you and I, a woman who has it all and knows there is something more. A woman brave enough to say, "I don't know how to be by myself". A woman, like you and I who often jumps from one relationship to another without a breather because we fear being alone. I URGE you, no, I IMPLORE you to give this book a second chance at a later time in your life if you did not like the first reading. I was a bit of douche canoe telling people it wasn't as good as the movie. It's fantastic and can stand alone, no movie necessary. But please, before you leave a negative review, reconsider any title you read. I was in a bad place when I read it the first time and that can affect anything, (like when you are in a bad mood and you stay at a hotel, you're more likely to nitpick the little details - check trip advisor if you don't believe me). This is the kind of book that you appreciate more the older you become and the more life experience you have under your belt. Perhaps if you are the type of person who is content to live life according to plan and never stray, this might not be the book for you. If you feel that taking care of yourself and learning to love yourself is selfish - this may not be the book for you. BUT, if you are ready, willing and able to understand that the grass is not always greener on the other side, then get it, read it and love it as I did the second time around. Thanks to Liz for putting herself out there so boldly and for withstanding some harsh criticism for doing what most people would never dare to do. If you love this book, check out WILD by Cheryl Strayed as well. Another fantastic read in the same genre. 5.0 out of 5 starsExcellent reading!! After reading other people's reviews of this book, I feel that a lot of the readers did not really understand the real story behind this book. Being in Elizabeth's position years and years ago, I only wish I had the guts to go on an adventure like Eat, Pray, and Love. Her journey was more of a Spiritual one and it really shows in the Pray part of the book. I myself am on a Spiritual Journey at this time and can really relate, especially to the meditation parts. It is really diffucult to learn how to meditate. I have been meditation for years and still haven't mastered it yet. It's not just about eating, praying and loving, it's about how a lot of us women live our lives for someone else, like our husbands and children and other family. We give up our lives when we become wives and mothers and don't even know what it's like to be number one in our own lives. Many people in our lives guilt us into living our lives for others. Life coaches always tell us we have to take care of ourselves first, then everyone else after. Well, this is what Elizabeth did, she took care of herself, finally, which is what more of us women should learn how to do. I thought this book was excellent, the movie was good, but the book of course was better. Loved her adventure. But one has to remember that was her's. Ours will be different. But don't we all want that one. I read a lot of great reviews of this book....but I find it is over rated. I found it boring, and after getting half way through, it is on the shelf. The book is great, well writen, not too heavy and pleasant to scroll through whenever you need to get away! But it's the story of a woman who needs change, who doesn't feel well with herself anymore, she's getting a divorce, she feels lonely and she drops everything (and gives everything to her ex) to get peace of mind. I'm just not going through a divorce and I'm not hopeless for change... but if you are; you will appreciate this book even more than me, because I can't relate to her. The 11 cd set came in perfect condition not a scratch on them..I love this and enjoyed it so much.I had only seen the movie and was disappointed when I was finished lsitening to it..You got to know Elisabeth in so much more detail. I got it for my daughter and she loved it. Excellent book that makes you reevaluate your life. In this day and age working and careers are so important. But are they? We all have it in us to take a second look at our lives and become spiritually connected to what is really important in life.